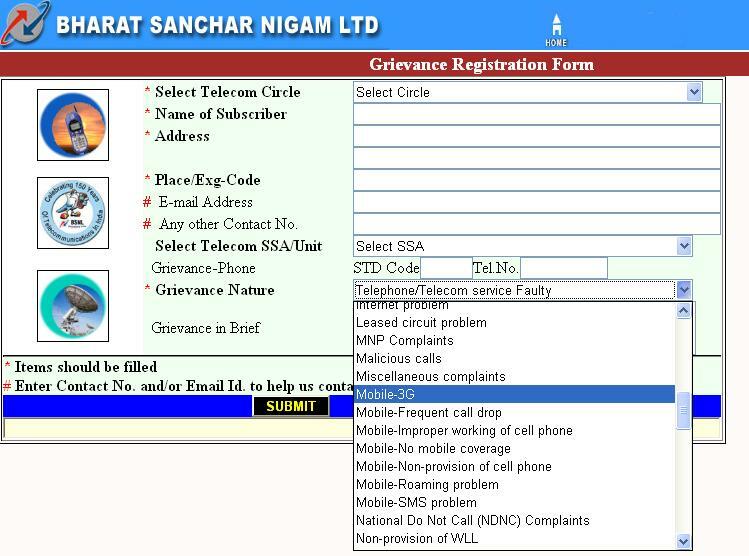 Good news for BSNL Mobile, Landline and Broadband customers who are facing tough time dealing with complaints, India’s Natioanl Telecom Backbone Bharat Sanchar Nigam Ltd (BSNL) today announced the launch of new Online Complaint Portal for its Mobile, Broadband and Landline customers which has made the process much simpler now for any complain related issue. BSNL has enhanced its Online Complaint portal and Public Redressal setup in BSNL has been introduced right from the Corporate Office to Telecom circles /SSA levels. The operator claims that now Circle Level and Corporate Level team will monitor all the complaints to resolve the issue within a specific time-frame. 198, 1500, 1501, 1503 which can be accessed from any BSNL phone toll free. BSNL Subscriber can register the Online complains on website : http://mis.bsnl.co.in/pgs/internet/pgwebregn.asp select Telecom Circle or State, Fill Customer Detail, Contact No (Must) on which BSNL Authority will contact you. Mention Grievance in Brief and submit it. You will get One ID, Note it for future reference.